NHS staff shortages seem an everyday fact of life - or at least a factor mentioned in several news stories each week. But why do these shortages persist and is there anything that can be done to get rid of them? In this week's In Business on BBC Radio 4, I spoke to historians, economists, nurses, doctors and other healthcare staff to try to get to the bottom of these questions. And to pose another one - does the NHS have the right mix of staff with the right mix of skills or could changing traditional roles rather than just boosting numbers help? And the Royal College of Midwives says the country needs 3,500 more midwives. Meanwhile, GP leaders and the Royal College of Emergency Medicine say the UK urgently needs greater numbers of general practitioners and emergency doctors - just a few of the medical specialities struggling with recruitment and retention right now. Increasingly, an older population, with often complex health needs, adds extra demand. But these problems are far from new. 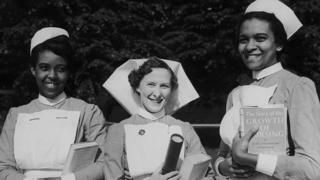 Stephanie Snow, medical historian at the University of Manchester, says staff shortages have existed since the very birth of the NHS, in 1948 - though people are often quick to label recruitment crises as one-off problems. She told the BBC: "Over the first decade in particular, the NHS expanded its specialist services rapidly and there were many new technologies on board. "All of these things led to unprecedented increases in the number of staff required. "By the time we get to the late 1960s, hospitals had to turn to mass recruitment, looking towards countries such as India, Pakistan, and Sri Lanka - where courses were taught in English and aligned to the UK's General Medical Council, as a consequence of colonial rule." Meanwhile, Anita Charlesworth, director of Research and Economics at the think tank, the Health Foundation, argues the UK has perpetually trained lower numbers of medical and nursing students than it needs. She said: "There is not a problem that we don't have enough bright, young people who would meet the standards and would love to have a career in medicine and nursing. "They just can't get a place. We have systematically trained fewer than we need." And she suggests being able to recruit doctors and nurses from overseas has offered a "get out of jail card" for successive staff shortages. Dr Mark Porter, of the doctors' union, the British Medical Association, argues we have generally staffed a health service we can afford - rather than look at what the population needs. But he says planning for the NHS workforce of the future is not easy. He said: "It is difficult to get planning perfect for every one of 50 or 60 specialities all of the time. "The population's needs are genuinely not quite as predictable as one might imagine. "We know the trajectory illnesses such as heart disease and diabetes are taking over the next five years. "But what about the next 25 years? "Will public health messages and new technology be successful, or won't they? "The answer could give us completely different trajectories in the future." For its part, the government says it plans to increase the numbers of doctors and nurses it trains and boost other healthcare staff too. At the Conservative Party conference in October 2016, Jeremy Hunt, the Health Secretary, said: "My job is to prepare the NHS for the future, and that means doing something today that we have never done properly before, and that's training enough doctors." The government announced there would be up to an extra 1,500 medical school places each year from 2018 in England. And, looking back, the NHS Confederation said there had been an extra 32,467 doctors employed in England in 2014 compared with 2004. Meanwhile, nurse numbers increased by 18,432. Health chiefs also say current plans to scrap nurse bursaries will help increase the number of nurse training places available this year - though whether this will work in practice is unclear and has been disputed by nursing leaders. Other positions such as nurse apprentices and physician associates are being explored. Physician associates (PAs) - trained to do some of the jobs junior doctors do, might be able to cut some pressures on wards. But current numbers are tiny, most cannot prescribe and they are not professionally regulated in the same way doctors are. Ms Charlesworth is worried options for filling shortages quickly might be running out. She said: "There's a massive gap globally now in the number of doctors and nurses compared to projected demand. "So India keeps many more of its doctors. "It has fantastic leading hospitals that are an exciting place to work if you are a young Indian doctor. "There is a global shortage of clinical healthcare staff." And of course there is another issue to consider. It is estimated about 10% doctors and 7% of nurses working in the NHS in England are nationals of other EU countries. The question is - could Brexit make NHS recruitment and retention problems even worse? To find out more and to hear some possible solutions, listen to: BBC Radio 4 - In Business, The NHS- The Recruitment Dilemma.